So the Tableau Conference is all done for another year. #Data16 gave me a warm, but rainy Texas welcome in Austin. Four days of hands-on sessions, meetups, discussions and parties went by in a whirl as they always do. Data16 was my 4th US Tableau Conference and it did not disappoint. My favourite part of any Tableau conference is always the opportunity to meet up with my Tableau friends, some of which I only get to see at conference. There's also the great opportunity to finally put a face to the avatar of so many great Tableau people I follow on Twitter. The meetups and awesome parties put on by the Tableau events team are great networking opportunities. This year the Tableau team also organised a brilliant evening social and a luncheon for the Tableau Ambassador program. All Tableau social media ambassadors, community ambassadors and user group leaders got a chance to meet up and chat. Me on the Tableau Ambassadors board! I attended some really great keynotes and sessions this year. The recordings are all available here. This is always a highlight of any Tableau conference. This year Tableau gave Devs on Stage its very own keynote and it did not disappoint. The Devs showcased some of the great new features coming soon. There are too many to mention here, but my favourites are: expressive text editing allowing you to include logos, colours and hyperlinks in your text elements; data connector for PDFs (I'm interested to see how it can cope with really messy PDFs though); join on calculations is going to be so useful; and finally natural language search is going to be a real game-changer. Search Twitter for #devsOnStage for even more opinions. The Information Lab crew ready to watch Devs on Stage! As a certified Tableau Trainer I'm able to deliver the official 2 or 3 day Tableau Desktop courses (Fundamentals, Intermediate and Advanced). Teaching Tableau is a real passion of mine and something I really love doing. However I wanted to know more about how colleges and universities are teaching Tableau to students in the classroom as part of their courses. If you didn't already know you can get free copies of Tableau Desktop to teach in education for the teacher and students. On a personal level I'd really like to get more young people using Tableau and getting involved in data analytics. So I went along to this meetup to see how I could get started. Whether that's giving up some of my free time to teach at local schools or colleges. Or to help some of the Universities I work with develop courses that use Tableau. The meetup had some great discussions from those in Higher Ed who are already delivering courses using Tableau. There are also a ton of curriculum resources out there if you're interested in teaching Tableau too. I have a passion for building strong Tableau communities and support networks in organisations. I think they're a great way to get people using Tableau and a way to share knowledge and resources. This meetup started some great conversations and grew my understanding of what problems organisations face when starting out with Tableau. Taught by the great instructor that is Christie Clark and her colleague (and physicist) Naz from Tableau. Survey data is my jam, so this was a must attend session for me and it did not disappoint. Naz started by blowing my mind with a completely different way to structure and use survey data in Tableau thanks to the new cross-database join. Christie also showed some new visualisation types that Level of Detail calculations make possible. If you work with survey data in Tableau you HAVE to watch this. The Tableau Labs were THE place to hang during conference. A room full of Tableau Devs and the opportunity to explore the features they're building was right up my street. I gave a ton of feedback on the new text formatting functionality. So much so that I got given a Tableau notebook as a thank you. The Devs were super excited about their work and were really welcome to hear feedback and even took notes! It's that kind of attitude and commitment to development that keeps Tableau at the forefront of data analytics. Data16 wrapped up with an excellent keynote by Bill Nye (the science guy) on the importance of the design process in engineering and tackling climate change. Very inspiring stuff. To close Data16 off Elissa Fink announced that Data17 will be in Vegas! See you there! I moved house this week. I spent the day lifting furniture and boxes up and down stairs, in to cars and vans and then unpacking the other end. I wondered how good a workout that was! 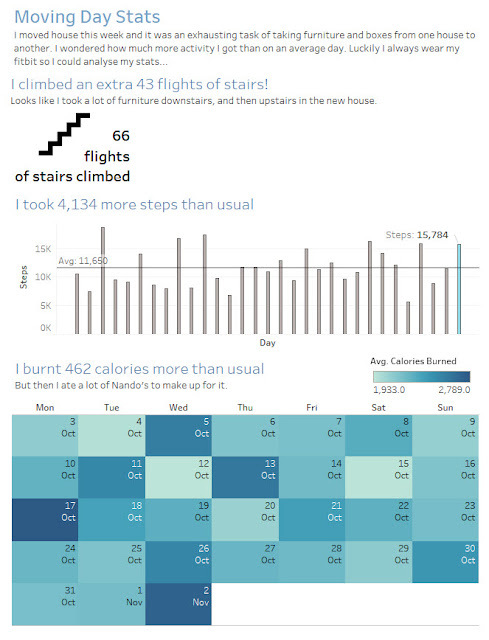 I always wear my Fitbit Surge so I thought I'd analyse my key stats to see how much exercise moving house really is. Click the image below to see the viz.